Home » Earth SOS » Why Recycle? Here’s a fact that many are unaware of… much of our waste ends up in oceans, harming birds, marine animals, and ultimately humans. Fallen rain or snow flowing along their natural route headed for sewage systems, storm drains, rivers, and streams, carry with them any garbage littered along its course; eventually concluding its journey inside vast bodies of life supporting waters. 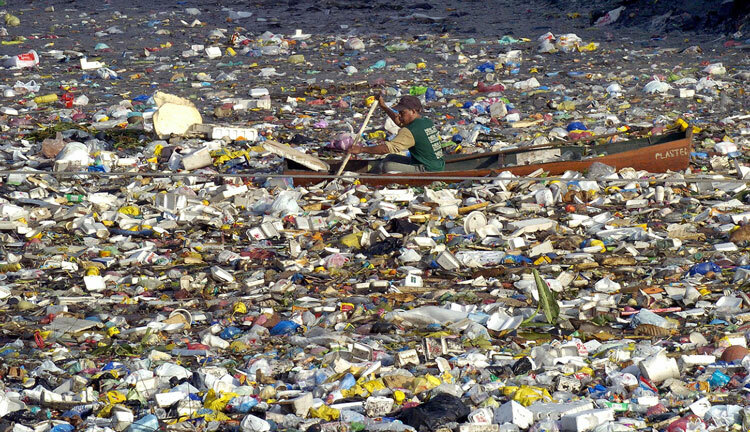 The Great Pacific Garbage Patch is symbolic to our littering, dumping, and poor recycling and waste management habits. Although there are many garbage patches in lakes, rivers, and oceans around the world, the Great Pacific Garbage Patch is the largest of its kind, stretching out twice the size of Texas, and weighing over 3.5 million tons. Although some of the waste is produced by ships and seafaring activities, it is estimated that approximately 80% of the waste comes from land based sources. Other reasons for debris finding its way into oceans are natural disasters such as hurricanes, tornadoes, tsunamis, floods, and strong winds. What is the most common type of debris found in the Great Pacific Garbage Patch? Almost 90% of garbage debris found is plastic. When exposed to ultraviolet light, most plastic becomes brittle. It is then easily broken into smaller pieces and eventually into micro pieces of plastic debris, sometimes referred to as “microplastics”. Strong currents colliding objects in the water trigger this breakdown. Which species are most affected by these garbage patches? The top three animals that are affected and face endangerment are: albatross, fish, and sea turtles. Albatross: From above, these large sea birds mistake the debris for food. Every year approximately 200,000 adult albatross die from the garbage patch and half of the babies born die from plastic and garbage contamination, passed on by their parents. Studies conducted by a scientist researching the death of albatross proved that on average, 45 pieces of garbage are found inside the birds. Albatross are only one example, among many bird species affected. Sea turtles: In addition to mistaking garbage for food, sea turtles are also conflicted with the threat of becoming entangled in fishing lines and ropes left behind by fishermen, to ultimately merge with the ever expanding, circulating refuse. Subsequently, this leads many sea turtles to their death. As a result, sea turtles are at a high risk of becoming extinct. Fish: The process of food chain contamination begins with small fish ingesting plastic and other noxious chemicals. Consequently, when bigger fish eat the contaminated fish, they too become contaminated. This process resumes until the top of the food chain similarly becomes poisoned by the release of these toxic chemicals inside their digestive systems. Dolphins and whales are among the hundreds of thousands of marine animals victimized to their death resulting from the garbage patch. Conclusively, at the top of the food chain, we find ourselves disconcerted at the notion that we are essentially the cause of our own defeat. Phytoplankton, responsible for producing half the world’s oxygen by means of photosynthesis, are microscopic plant life that serve a vital purpose in both the oceans ecosystem, and the earth’s atmosphere. They remain at the base of the marine food web, providing marine animals a nutritional diet. Phytoplankton remove carbon from the atmosphere and place it deep into the ocean, making it a key player in reducing greenhouse gases that cause global warming and climate change. Studies have shown that plastic prevails phytoplankton in the Pacific Ocean by six times. This denotes that for every single organism of phytoplankton, there is 6 parts microplastic. The detrimental effects are severe, altering the natural process of ocean and atmospheric biosphere. Marine debris is acting as a sun filter, inhibiting the phytoplankton from conducting photosynthesis. 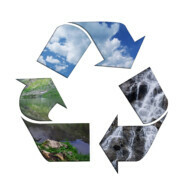 When we don’t recycle, our waste is taken to landfills where it is burned or left to decompose. Landfill space is becoming an increasing problem. Since there are many health risks associated with living too close to landfills, finding suitable locations are challenging. In Canada, landfill sites produce about 30 mega-tones of carbon dioxide equivalent in methane emissions annually[i]. Since methane gas is a greenhouse gas that contributes to global warming, landfills around the world are a growing concern. Canadians can significantly reduce methane emissions by composting their organic matter, such as coffee grind, fruits, vegetables, etc. If we don’t change our production and consumption habits, we will eventually run out of our natural resources. Americans use 4 million plastic bottles every hour, yet only 1 bottle out of 4 is recycled. Recycling glass saves 25% to 32% more energy than making glass from virgin raw materials. The energy you save by recycling a single aluminum can run a TV for three hours.